Library image #2782: Autumn storm breaking on quartzite cliffs. The United States Congress designated the Far South Egans Wilderness (map) in 2004 and it now has a total of 36,299 acres. All of this wilderness is located in Nevada and is managed by the Bureau of Land Management. The Far South Egans Wilderness consists primarily of an extremely rugged portion of the Egan Range. A mountain range not quite ready to surrender, the Egan Range dramatically ascends from about 5,800 feet to 9,823 feet to form the spectacular limestone cliffs with multicolored strata. The area includes an unusual and scenic intermixed Ponderosa and Bristlecone pine forest. 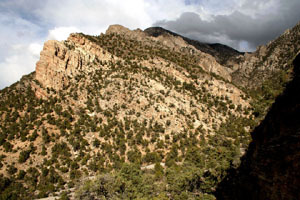 The east side of the Egan Range is less rugged and supports a dense cover of woodlands (pinyon and juniper). Large stands of ponderosa exist at higher elevations (7,000 feet). Mule deer, elk, bighorn sheep, mountain lions, and raptors such as golden eagles and ferruginous hawks are among numerous wildlife species found in the mountains of the Far South Egans Wilderness. Planning to Visit the Far South Egans Wilderness? How to follow the seven standard Leave No Trace principles differs in different parts of the country (desert vs. Rocky Mountains). Click on any of the principles listed below to learn more about how they apply in the Far South Egans Wilderness.